Janelle Clave, 65, of Eagle Grove, is assisted by Vincent firefighters and paramedics after the car she was driving was hit from behind by a semitrailer Tuesday afternoon. The truck was driven by Lance LaRue, 47, of Clarion. The crash occurred on 170th Street, west of Quail Avenue. According to Trevir Michehl, Webster County sheriff’s deputy, lime on the roadway caused a cloud of dust, impacting visibility. Clave slowed down her vehicle and LaRue was unable to stop the truck in time before crashing into the car, Michehl said. The car was spun into the north ditch. Clave was treated on scene for minor injuries and was transported by ambulance to UnityPoint Health — Trinity Regional Medical Center. Vincent firefighters cleaned the roadway of the lime. 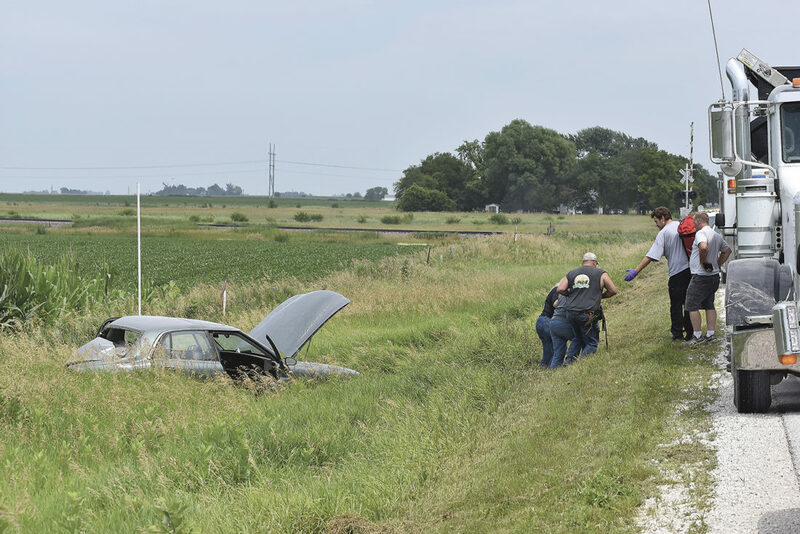 Vincent Volunteer Fire Department, Vincent Ambulance, Iowa Department of Natural Resources, and Webster County sheriff’s deputies were on scene.